The Cincinnati Reds optioned right-hander Jumbo Diaz to Triple-A Louisville and promoted RHP Nate Adcock from the Bats on Sunday. Kenley Jansen, who saved 44 games for the Dodgers last season, is expected to be on the disabled list until the around first week of May. San Diego Padres shortstop Everth Cabrera and New York Mets outfielder Eric Young Jr. were among 32 players tossed into the free-agent market Tuesday. LOS ANGELES -- The Los Angeles Dodgers elected to tender a 2015 contract to catcher A.J. Ellis, the team announced Tuesday night.Ellis batted .191 last season, but the Dodgers value his ability to work with their pitchers, particularly with the National League's reigning Cy Young and MVP winner Clayton Kershaw, a close friend. 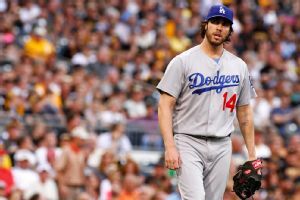 PITTSBURGH -- Before Dan Haren signed with the Los Angeles Dodgers, rumors still persisted that the team was intent on landing Masahiro Tanaka. He knew that Chad Billingsley was on the comeback trail. Our weekly statistical review of the interesting and unusual in the major leagues.Theme of the Week: A Good & Wacky Week for CatchersThere were a pair of three-homer games last Wednesday afternoonone was by Cubs catcher Dioner Navarro. The Los Angeles Dodgers will start Matt Magill against the Colorado Rockies after Hyun-Jin Ryu was a late scratch with a bruised left foot. The odds of Ted Lilly making his next scheduled start for the Dodgers seem to be declining by the day. Lilly felt tightness in his back after his start against the Mets last week and the issue flared up again in an ineffective outing Monday against the Rockies. 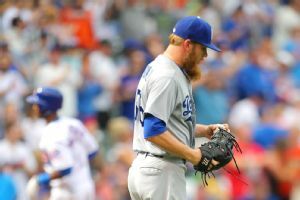 LOS ANGELES -- The Los Angeles Dodgers got a nice pick-me-up for a depleted rotation when Matt Magill pitched into the seventh inning in his major league debut Saturday night.